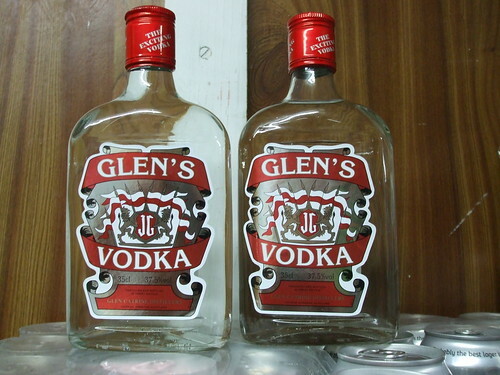 Fake bottles of alcohol seized by Surrey County Council Trading Standards. A slightly wonky label and different levels of liquid aroused trading standards officers suspicions. Fears over criminal gangs flooding the UK with fake alcohol ahead of Diamond Jubilee and Euro 2012 celebrations have sparked a warning to drinkers. One of the bottles of fake wine contained a dead spider and a fruit fly. Steve Playle, Surrey County Council Trading Standards investigations and enforcement manager, said: “The sale of fake alcohol can be linked to criminal gangs who turn up at shops offering cheap drink, often from the back of a white van. We’re concerned the criminal underworld will be looking to make a quick buck by selling cheap drink ahead of Diamond Jubilee and Euro 2012 celebrations. Surrey County Council Trading Standard’s latest prosecution resulted in Balwant Safri, 38, owner of Staines Food and Wine in the Broadway, Staines-upon-Thames, being ordered to pay almost £6,500 in fines and costs at Staines Magistrates’ Court on May 9. He pleaded guilty to six offences under the Trade Marks Act 1994, two offences under the Food Safety Act 1990 and one offence under the General Food Regulations 2004. Safri said the alcohol had been supplied by a white van man. Surrey County Council Trading Standards officers seized the booze during two inspections in March and May 2011. In an unrelated prosecution last year, a shopkeeper was fined £10,000 for selling vodka that could have blinded drinkers, following an investigation by Surrey County Council Trading Standards. The toxic tipple was found to contain 235 times the legal level of methanol when tested in a lab. Surrey County Council is working with traders to encourage them not to buy alcohol from disreputable suppliers. Anyone with information on the sale of fake alcohol should contact the Citizens’ Advice consumer helpline on 08454 04 05 06.